The Most Reverend Archbishop Jean-Louis Bruguès, O.P., secretary of the Congregation for Catholic Education, will deliver the 2012 Terrence R. Keeley Vatican Lecture at 4:30 p.m. March 22 (Thursday) in the Eck Visitors’ Center Auditorium at the University of Notre Dame. Sponsored by the Nanovic Institute for European Studies, his lecture is titled “The Second Vatican Council Ahead of Us,” and is free and open to the public. Bruguès is also scheduled to celebrate Mass in the Basilica of the Sacred Heart at Notre Dame at 5:15 p.m. March 23 (Friday). Bruguès was born in Bagnères-de-Bigorre near the Pyrenees and studied at the Paris Institute of Political Studies (Sciences Po) before earning a doctorate in theology. Ordained in 1975, he is a member of the Order of Friars Preachers. 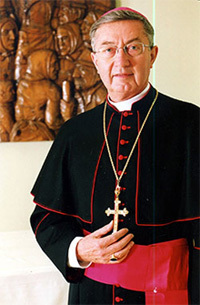 Shortly after being appointed bishop of Angers in 2000, he was elected president of the Doctrinal Commission of the French Episcopal Conference. Since 2007, Bruguès has served as secretary of the Congregation for Catholic Education under the prefecture of Cardinal Zenon Grocholewski. This congregation has authority over all seminaries, houses of religious and secular formation, and all universities, faculties and educational institutes that fall under its purview. Bruguès’ activities are focused in the Congregation’s Office for Universities. The annual Terrence R. Keeley Vatican Lecture provides the Notre Dame community with the opportunity to interact with distinguished representatives from the Holy See and significant dioceses of Europe. Past lecturers have included Cardinal Angelo Amato from Italy, Cardinal Reinhard Marx from Germany and Archbishop Charles J. Brown, the recently appointed Apostolic Nuncio to Ireland. More information on the lecture and the series is available at nanovic.nd.edu. Originally published by Jennifer Lechtanski at newsinfo.nd.edu on March 16, 2012.